Another week of training and another step forward in injury recovery is completed. Over the past several weeks, I’ve built back up to five continuous runs per week. This week, I added in small amounts of faster running. 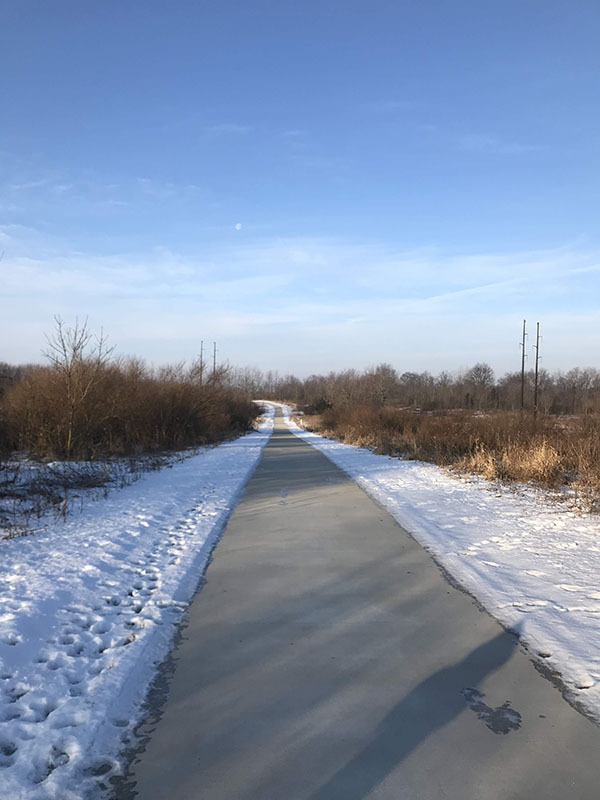 All of the faster running was done indoors, thanks to ice and frigid temperatures, but even in the overheated track or on the dreadmill, picking up the pace felt good. Ryan had a holiday for MLK Day so we were able to run together. We briefly considered a trail run until we checked the weather. The temperature was 5 degrees Fahrenheit with an even colder wind chill. We then debated the indoor track, but that tends to be crowded and we wanted to be able to talk while we ran. So we went to a local park with a 3/4 mile paved loop and ran around that. We both wanted the option to easily quit if we needed to. The path was packed with snow and the temperature was biting, so we kept our pace slow and effort easy. It’s after runs like that that a fireplace in our living room is so wonderful. 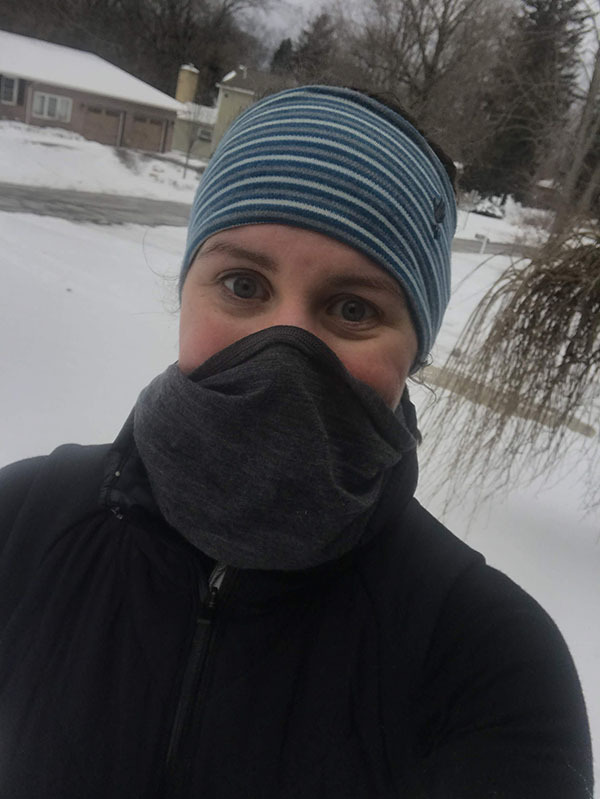 I bundled up again for this run and shuffled slowly along snowy sidewalks. I felt pretty good, actually, for the first 20 minutes; then I turned around and encountered a brutal headwind, the type that leaves your legs feeling powerless. Despite that, this run still felt good! I’ll run in bitterly cold temperatures and snow, but I can no longer tolerate cold rain. The forecast predicted temperatures in the mid-30s and rain. I opted for the indoor track, both for a break from the weather and a softer surface underfoot than ice and pavement. The indoor track is a pleasant alternative to the treadmill, but 200m laps can still be monotonous. I sprinkled 8 x 30 seconds surge, 60 seconds easy into the middle of the run for some variety. 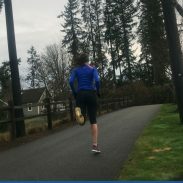 These short intervals (almost similar to strides) serve as a safe reintroduction to faster running. 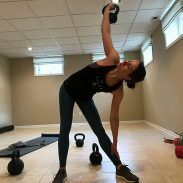 For strength training, I did reverse flyes, bicep curls to shoulder press, single leg deadlifts, offset reverse lunges, resistance band deadbugs, Palloff presses, and side planks. When I enjoy a strength workout, I tend to stick to the same exercises for several weeks and just increase the weights as I need. Initially, I intended to either rest or cross-train. But then the sun came out and the temperatures were approximately 20 degrees warmer than the forecast for the next few days. I love running in 15-25 degree temperatures but cannot say the same about 0 degree temperatures. I’m glad I ran because this run was really wonderful. The first mile 10 minutes or so were slow due to icy patches on the road. I briefly questioned if I should turn around based on the ice, but it wasn’t as bad as I initially thought as long as I chose the right path. One bike path in town is almost completely cleared, so once I arrived there, I settled into a comfortable pace. My middle two miles on that path were at an 8:15/mile and that felt so good. The wind chill was bitter on Friday and the temperatures barely rose above 0. Needless to say, I was happy to rest. My current limit is probably single digits with a windchill above zero. I did a few maintenance exercises with the resistance band and braved the cold only to walk the dogs – and spend the rest of the day working from the warmth of the house. It was still bitterly cold outside. I probably would have bundled up and braved the cold if on my own, but since I had Ryan’s company, the gym was more tolerable. We split our run into two parts: a warm-up on the indoor track together and then separate workouts on the treadmill. Warming up on the track made the treadmill more tolerable. We ran 8 laps (one mile) on the track. On the treadmill, I ran four repeats of 2 minutes easy, 5 minutes at tempo, plus a brief cool-down. I ran the tempo intervals at 7:15-7:30/mile. My fitness still isn’t close to what it was pre-injury, but I’m happy with each step along the way. Those TRX bridges are particularly challenging! What’s your limit for running outdoors in winter? Nice work on the workouts despite the cold! I haven’t run on an indoor track in a few years. I was at my parents house in Michigan during training for Boston. It was below zero with a windchill of -30. They don’t have a gym but there was an indoor track around a basketball court. I ran 8 miles on that thing all while having to dodge senior citizens. I think I blacked out for most of it because I don’t know how I numbed my brain to get through that. Lol! That many miles on an indoor track is impressive! I’d probably have to block out all those laps as well. You’re doing great getting back to running! The paces will soon follow. My hamstring definitely felt those yesterday as well! And thank you! I’m so glad you’re building up your runs and mileage nicely!! You must be so happy!! 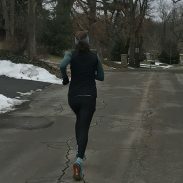 That’s great that you were able to do your long run on a mild day! The sun truly makes everything better. Nice week for you! You are so patient with your comeback. I still have a TRX I bought last year that I haven’t set up yet. Your post reminded me to do that! Especially because running outside has been such a challenge the last couple of weeks–I need something else to do. Thank you! 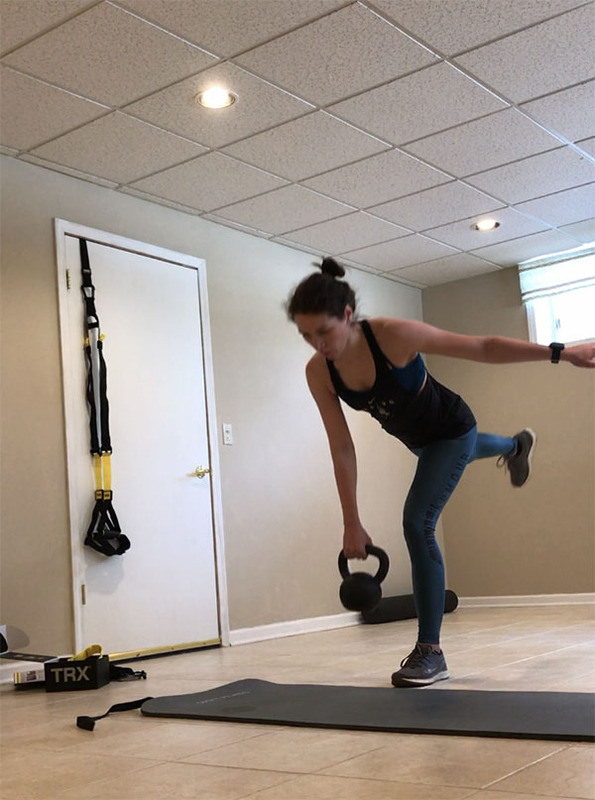 The TRX is definitely a fun tool to have when it’s too cold to go outside. i totally have winter limits now, more than ever before! i really can’t do below freezing until there’s a lot of sun and no wind lol — and really ,anything below 27 i think is a total cut off regardless for me. i used to run in the rain and cold, i just can’t anymore. 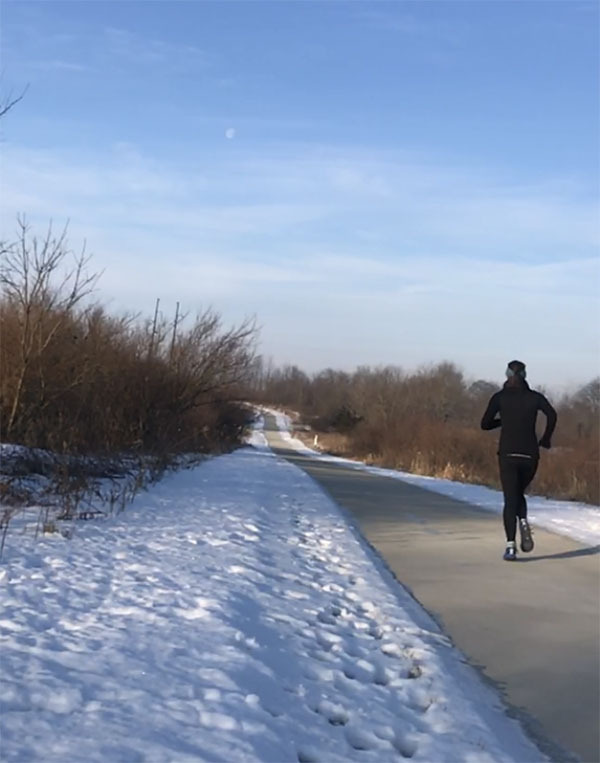 I have done short runs in sub-zero temps, but I feel like long runs aren’t worth the frostbite risk. It’s hard to keep all your skin covered while running!